President Franklin D. Roosevelt is in need of company as dictated by his mother. Daisy, a cousin of his, is called to cheer him up. What ensues is an intimate friendship until Daisy finds out there are other women in the president’s life aside from his wife Eleanor, of course. Amidst all this, King George VI of England pays a visit to the States to secure an alliance in case Germany invades Great Britain. Despite the hype surrounding this movie, I confess I was disappointed. Bill Murray’s performance as Franklin D. Roosevelt is good but not great, not on the same acting level as Daniel Day-Lewis’ Lincoln. Bill Murray is refreshing in the role of Roosevelt, maybe too refreshing given the political climate that he was facing at that time. I particularly enjoyed the scenes of King George VI’s visit to Roosevelt’s Hyde Park mansion and they shared the flaws each had and the uniqueness they brought to their political roles. When King George VI complained about his stutter, Roosevelt replied that polio was more of a problem. But something that bound both men was sharing hot dogs at a picnic organized by Eleanor Roosevelt. The King and Queen considered eating hot dogs as something undignified, but when the King showed he could eat a common man’s meal, he found sympathy for his plight and a powerful ally. Laura Linney’s performance as Daisy is too restrained. Most of the times I love Laura Linney’s performances; she impregnates her roles with intense determination, but in Hyde Park on the Hudson she falls short, afraid perhaps to outshine the rest of the cast who is no match for her talent. 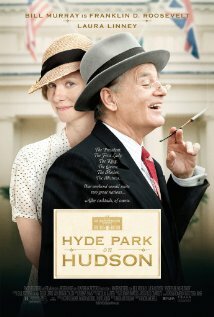 Hyde Park on the Hudson focuses more on the carefree ways of aging Roosevelt, on his sexual exploits (despite not showing it openly on screen) with at least three mistresses at the same time one of whom is Daisy, his “fifth or sixth cousin depending how you count”. I say that after seeing this movie my viewing of Roosevelt as a politician is rather fractured. Overall, not a great movie but worth watching if only to add another dimension to Roosevelt as the man behind the politician.